This was the hardest song for me that we have ever recorded. I kept thinking of my own "little boy", all grown up, now a Marine, having served in war. I could barely sing the words for the tears streaming down my face. For all the "someone's sons" (and daughters) who have served our country; for all those who have "raised a gun; for those parents and families who have waited so patiently for them to return; and especially for those who wait still, you have my heart-felt appreciation. And to my son, thank you. It is a recurring dream and it is always disturbing. I dream that my husband and I are at some event, such as a wedding, in a city away from home. At some point we become separated and I spend a great deal of time searching for him without success. Image by quinet via FlickrIn my dream today, we had attended a wedding and then traveled to the bride's house for the reception. I looked for him in every room, but he was no where to be found. The hallways and doorways in the house were extremely narrow, the staircases circuitous. 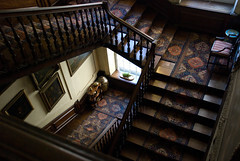 The end of each staircase was blocked with some type of obstacle which must be overcome -- one was blocked by a very large man sleeping with an enormous quilt. Each time I would encounter him he would grunt, begrudgingly move his quilt, then move himself only the slightest amount. I would try to squeeze through the tiny gap created without touching, or disturbing the man any further than I had already. The doors to each entry and staircase never gave any indication to what was beyond, so I never knew where I was headed when I opened a door and apparently in my dream there was no going back either. I just kept making the same circuits of multiple routes, looking in every nook and cranny for my husband, finding no sign or trace of him. As my search continued unsuccessfully, my frustration mounted. In each dream, there is no place for rest, no site of respite, no friendly face. I am in an unfamiliar place surrounded by people I have barely met. Finally, near the end of my dream, I hear the strum of a guitar which leads me to find my husband. By that time I am either completely frustrated or just downright angry. Now you may not have ever seen this Irish Greek girl get mad, but I promise you, it is not a pretty sight. My husband of course, is totally surprised that I should feel that way. After all, what am I so upset about? What was there to be frustrated about? Angry about? No amount of talking, crying, stomping my weary little foot can cause him to see -- or feel-- what I feel. I wake up feeling abandoned, misunderstood and most of all. . .alone. It is a sad feeling. Fortunately, I have a very kind and supportive husband who reassures me that he would never behave in that way, and indeed he never has. But the feelings don't easily go away, especially that feeling of alone-ness. "Who shall separate us from the love of Christ? shall tribulation, or distress, or persecution, or famine, or nakedness, or peril, or sword? As it is written, For thy sake we are killed all the day long; we are accounted as sheep for the slaughter. Nay, in all these things we are more than conquerors through Him that loved us. For I am persuaded, that neither death, nor life, nor angels, nor principalities, nor powers, nor things present, nor things to come, Nor height, nor depth, nor any other creature, shall be able to separate us from the love of God, which is in Christ Jesus our Lord," (Romans 8:35-39). Whether we are in a room full of strangers or physically all alone, we will never be alone. We cannot be separated from the One who laid down His life that we might eternally be joined to Him in glory. Last time I wrote about how my husband said he would like to put our friend Steve on his keyring, because Steve is so handy at doing things. He said he'd just like to have him "in his pocket." Today, I want to tell you about actually having Steve in my pocket. Our church fellowship which meets each Sunday evening, has the practice of writing the name of each person present on a slip of paper. The slips are placed in a beautiful box our friend Arman's mother brought us from Iran. Each person removes a slip from the box and prays for that particular person throughout the week. We have two dogs, our beagle Sparrow and our friend Karen's poodle, Lucy, who also attend our fellowship. Their names usually end up on someone's slip, too. Sparrow and Lucy are such faithful church goers, I am sure they pray for each other. Each person does different things with their slip of paper. Some don't need the slip to remember who to pray for. My husband keeps his in his wallet so everytime he opens it, he sees the name.This week, I am the name on the slip of paper in his wallet. Usually, I put the name on my To-Do list on my ipod and then throw away the paper slip. This Sunday I drew Steve's name and for some reason, I put the folded piece of paper in my pocket. I found that all through the evening, whenever I would put my hand in my pocket and touch the piece of paper, it was a reminder of Steve and I would be prompted to pray for him. I didn't even need to see the paper -- just touching it was sufficient. This impressed me so much, that I kept the slip of paper in my pocket the next day when I went to work and it had the same effect. It was as if I was carrying Steve around in my pocket so that I could be reminded of him and pray for him at any time throughout the day. This reminded me of the High Priests of the children of Israel who would wear the ephod upon which had onyx stones on the shoulders. These stones were engraved with the names of the tribes of the children of Israel so Aaron could "bear their names before the LORD upon his two shoulders for a memorial, " (Exodus 28:12). 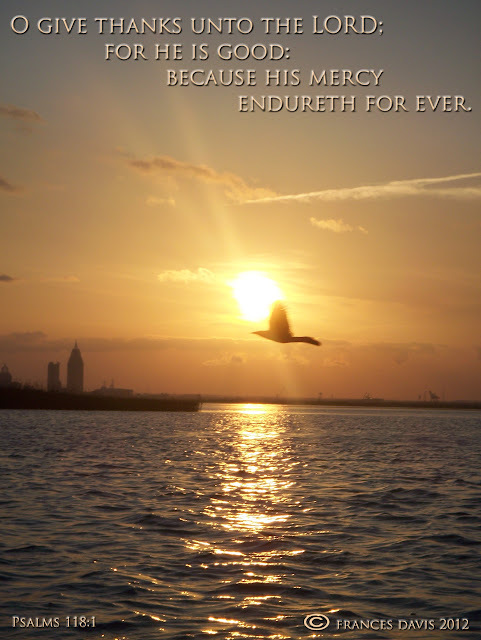 More importantly, it made me think of the Lord Jesus who "ever liveth to make intercession" for us, (Hebrew 7:25). He needs no little slip of paper in His pocket to remember to pray for us. . .it is His great love for us which prompts the prayers without ceasing for His church, His body, His bride. Instead of wearing an ephod with our names, He bears the wounds in His hands, His feet and His side. He never fails to pray and His prayers never fail. You may not have a close fellowship of believers with which to swap slips of paper, but I would encourage you to do a similar thing with those for whom you pray. Try writing the name of just one of them on a slip of paper and tucking it in your pocket. . .carry that person with you every where you go, and see how often you are reminded to lift their name before the Lord. Saturday we had a wonderful day with our dear friend Steve. He took us to a beautiful lake, introduced us to fishing, taught us how to put bait on the hooks, how to pull in the fish and how to protect ourselves from the fins. We actually managed to catch some fish in spite of our novice status. I suppose it goes without saying that all credit for the fish in the cooler ultimately must be for the excellent instruction we had along the way. After a morning of fishing, we had a great lunch together and a delicious dessert. We had hours of wonderful fellowship together which was as enjoyable as the fishing and the lunch. After that, we needed to check on our youngest daughter's car which had broken down. Steve volunteered to drive us there and it was a good thing he did. We were unable to discover the problem, but Steve not only quickly identified the problem, but fixed it as well. It was then my husband said, "I think I'm going to put Steve on my keyring! He'd be handy to just keep in my pocket!" I agree. Having someone like Steve in my pocket would be a great idea since he can do just about anything. Knowing Steve's humility, he would quickly argue this fact, but I know he would agree that as Christians we do have Someone with infinite powers "in our pockets." When we believed in the Lord Jesus Christ as our Lord and Savior, His Spirit took up residence in our spirits. Our spirits have been joined to the point the Scriptures say we are "one spirit". Inside of us dwells the Spirit of the God of the ages, the One who spoke the worlds into being, the One who calmed the winds and the waves with His words, the One who conquered death and hell. He knows our every need before we do and has promised, "before they call, I will answer." (Isaiah 65:24). It is His desire to "give you the kingdom," (Luke 12:32).He supplies "all our need by His riches in glory by Christ Jesus," (Philippians 4:19) and ever makes intercession for us. " In Him we live and move and have our being," (Acts 17:28), and He is in us. In us and all around us. In our hearts, in our pockets as it were, and all around us. . .He is waiting for His children to call His name. How great is that?? In Labor and Delivery where I work, each mother and baby couplet are tagged together with matching bracelets. The mother wears one and the baby two. Each bracelet has a bold black number which connects the two together. On the footprint sheet upon which the baby's first --and official-- footprints are recorded, is also recorded this bold black number. The mother's fingerprint is also on this sheet. So, before the baby leaves the room in which it was born, it is tagged as belonging to the mother and it will wear this identification the whole time it is in the hospital. The moment we accept the Lord Jesus as our Lord and Savior, we become imprinted with HIS identification as well. We are identified with Him in a way which will never be removed. He creates in us a new heart created in righteousness (His righteousness) and true holiness, and we enter into the family of Father, Son and Holy Spirit that has always existed from before the creation of the worlds. What a wonderful thought that even if I temporarily forget "who I am", He does not. I am identified with Him -- I am imprinted with His name, His Spirit, His life -- and I cannot be lost from Him no matter what. September 28th: Last evening, Rev. Dr. Husten made a speech at the depot, calling on the people to send up provisions and nurses to Chickamauga, for the purpose of feeding and nursing the wounded, as General Bragg has gone with his whole army to take Chattanooga, and requires the services of every man who is able to travel, and there are not enough left to take care of the sufferers. The enemy has destroyed a portion of the railroad, and the wounded had to be taken to a place called the "Burnt Shed", some twenty miles distant from the battle-field, there to await transportation on the cars. I intend leaving this afternoon, and am busy collecting what I can to take with me. October 6th: Left her on the 28th about 3 o'clock a.m. The cars were densely crowded with soldiers returning to their commands. When we arrived at the Burnt Shed, found that the rail track had been finished to Ringgold; so we passed on to that place. As I was familiar with it, I went to the nearest building, which had been the Bragg Hospital. Wounded men, wrapped in their blankets, were lying on the balcony. I went into a room which was filled with others in the same state; some of whom were suffering for want of water. I remained there until after breakfast; then I went down to the main hospital, where I was introduced to the surgeon in charge, Dr. Ussery. He gave me bandages to roll. Mr. Deering and myself sat on the up-stairs gallery, where we could see the wagon trains come in with their precious burdens. As many as fifty came in at one time. We rolled bandages until the afternoon, and could scarcely supply the demand. This work had been quite trial for me, as I had been compelled to see our poor fellows brought in as they were taken from the field hospital, and I had no chance of doing any thing for them. Next morning, I arose early. On reaching the hospital,to my joy and surprise, I found that Dr. Stout had arrived early in the morning, and with him a hospital corps of surgeons and nurses. I knew that now the wounded would be well cared for. I had made up my mind, on seeing so many there to take care of the wounded, that I would go right back to Newman, as I had left Mrs. Williamson quiet sick and much work to do. I have always had a great desire to go on a battle-field. I can not call it idle curiosity; but a wish to see and know the most of everything, so that I might judge for myself, and know how I may be of service. There was a Mrs. Weir, from Griffin, Georgia, who had come to nurse her son. He had lost a leg, and was at a private house near the battle-field. This lady told me she had a young friend, whose corpse she had heard was still on the battle-field unburied. She kindly asked me to go with her. The field was some fifteen miles distant; so we had to watch our chances of getting a conveyance. There were wagons coming in all the time with the wounded, but none going back that day; so an opportunity for getting out seemed slender. Mr. Deering was on the watch for us. A very nice-looking covered private wagon came, and after depositing its load, Dr. Deering requested the owner to take us; but he stoutly refused, saying his horses were completely worn out. Mr. Deering then told him that there was one of the ladies who had nursed at least one thousand Confederates, and was very anxious to go out to the field. He immediately drew up and invited us all in, Mr. Deering going with us. We traveled over the roughest roads I ever was on. I thought, if this was the road our wounded had to come, they must indeed suffer; and, sure enough, we met what seemed to me hundreds of wagons, with their loads, going to Ringgold. As we rode out the tents of the different field hospitals came in view; when we thought of the inmates and their sufferins, it only served to add to the gloom. I tried to look neither to the riht or lieft, for I knew there were many pairs of eyes looking sadly at us from the sheds and tents. I could do nothing for them, and when that is the case, I try to steel my heart against their sorrows. I looked in the direction of the battle-field, and though of the nameless dead who were there. I though of the awful conflict which had so recently raged between brother and brother. We were near that fatal stream --the Chickamauga --the "River of Death!" How prophetic its name! I could think of nothing but that terrible strife, and our gallant patriots that fell there. . .
We went to another place, where we were told the worst wounded were. Dr. Rice introduced us to one of his surgeons, who took us into a "fly" about one hundred feet long, and every man in it had a limb amputated. It was a sad sight, and I could scarcely refrain from tears. I concluded not to visit the battle-field, as much time had elapsed since the battle. I am told that the effluvia arising from the carnage makes it almost impossible to go within a mile of it. I cannot begin to imagine what Kate went through as a nurse. All of us as nurses witness suffering, many of us witness death. We all see sorrow in caring for our patients and their families. But Kate saw horrible mutilation, suffering and death every day. She saw the ravages of war not only on bodies but on a beloved countryside as well. I cannot think what pain she must have felt and the prayers she must have lifted up to her Lord to enable her to continue on. And Kate didn't just continue on, she pressed forward, as her desire to go to the battle-field and the field hospital shows. There are so many nurses today who press forward. Nurses who may be experiencing their own personal pain, their own suffering and yet they bury it so that their patients never see it. They carry on, they smile -- even when they feel like crying -- so they can treat, they can help and they can heal. You are the very heart of nursing. I had picked it up at the store almost as an afterthought. Once home, I put it on top of the refrigerator and then promptly forgot about it. That is until the next week when Jack and Emma came to visit. "Oh, look," I said to Jack, taking down the small box of sidewalk chalk, "I bought some sidewalk chalk for you." Jack took the blue box from my hand and ran to Emma, his excitement audible in his voice, "Emma, look! We have chalk! Frannie bought us some chalk!" Nothing else would do but we had to put on our shoes and head out to the sidewalk. We all sat down and began to draw this and that, nothing and everything. Jack was so excited when he drew his first stick-man. Emma and I drew hearts and flowers and curley-que nothings. But you would have thought in possessing the sidewalk chalk those children possessed the greatest treasure of the ages. and He shall give thee the desires of thine heart." I once heard a preacher say that if you don't think the Lord will give you the desires of your heart, it's just that you don't know what the desires of your heart really are! His point was that what we really desire is Jesus and when we delight ourselves in the Lord, He gives us what our heart really desires. Our grandchildren may have thought they desired many things if I had asked them what they wanted before I handed them the chalk, but they wanted the chalk. They wanted the chalk not because they wanted to draw, not because they love the colors of the chalk, but because they know when they draw with the chalk they draw with Frannie. (If they are really lucky, Emmie will come out and draw with them, too!) It is the being together, the sharing the drawing, the love they feel that causes the excitement with the sidewalk chalk. The Lord knows those things of which we need. He knows as well those things which we desire, but He knows those things after which our spirits truly thirst. He knows exactly what it is which will satisfy that thirst, it is Him. And having Him, we have all. for it is your Father's good pleasure to give you the kingdom." Nursing is one of the few professions that allows a person to almost completely change their career while staying in the same profession. Nursing offers the ease of movement from one specialty to another so that a person can find an area in which he or she is happy and interested. I have benefited from this ease myself, beginning as a neonatal nurse, then becoming an obstetric nurse. I even worked for three years as a "clinical computer analyst" before moving back to obstetrics. It is a comfort to know that if you become dissatisfied in one area, you can learn and explore another. As I read Kate's journal, I am impressed with how much change she encountered. She traveled from hospital to hospital, location to location. She dealt with men acutely wounded being carrying in fresh from the battle field and she worked in a hospital primarily caring for men with chronic ailments. July 23, 1863: We have arrived in Kingston, Georgia, last evening, and put up at one of the hotels. Dr. Avent called early this morning: he is post surgeon and highly respected for his surgical abilities. The first information we received from him was that he did not approve of ladies in hospitals; that was nothing new from a doctor, but we were a little taken aback to hear it said so bluntly. He then told us his principal objection was, that the accommodations in hospitals were not fit for ladies. We assured him he need give himself no uneasiness on that score, as we were all good soldiers, and had been accustomed to hardships. We were escorted to the house which we now occupy. it consists of two small rooms on the ground floor. We are about a square and a half from the dining-room and kitchen; so when Drs. Avent and Hopping called to take us to dinner, we made quite a procession. On the way, Dr. Avent informed me that he was a strict disciplinarian, and as I had charge of every thing in the domestic line, if there was not a good dinner that day, he would call me to account. I laughed and told him, if he talked in that way, I should think him a real Pharaoh, as I had not even had time to look around me. August 1st: We have a number of patients very sick, and we are kept very busy, as the two girls we brought with us from Chattanooga are both ill, and I suppose will have to leave. Two of our cooks are also down. I asked Dr. Avent to let some of the men come and assist in the kitchen, but he refused, saying that such work was degrading to them. August 3rd: I am beginning to think that we shall not be able to remain here, as Dr. Avent has proved himself a real Pharaoh -- expecting brick without straw. We have many sick and much to do. We have no wash house. When I asked Dr. Avent for one, he told me that his grandmother and mother never had any but the canopy of heaven for theirs, and he did not intend having any others in the hospital. I argued the case with him as best I could, I told him that a hospital was not a private house, and it was our duty to do all in our power to promote the health of the attendants as well as the patients; and that whoever washed ought to have a covering of some kind; and the clothing, whether dirty or clean, needed to be covered in case of rain. I found him inexorable. I have made up my mind to let things take their course, and if I find I can not get along, will leave. August 7th: I intend leaving today for Chattanooga. This morning I sent for Dr. Avent and told him that it was impossible for us to get along without more servants; and I told him further that I knew of some who could be hired, and asked his consent; but he would not give it. So I then told him that Mrs. Williamson and myself would leave. At this he became quite angry, and said he could not compel us to remain, but since he had hired us ladies, he would pay us for the time we had been there. The latter part he said with emphasis, and then left me. Had he remained longer, I would have informed him that when we "hired" ourselves, we were not aware it was to him, but to the same government which had "hired" him. I ask but one thing from any surgeon, and that is to be treated with the same respect due to men in their own sphere of life. I waive all claim for that due me as a lady, but think I have a right to expect the other. I scarcely think that Dr. Avent would dared to have spoken to one of his assistant surgeons as he did to me. Well, these trials must be endured for a little while; they will soon, I trust, be over with; and then, it is for the cause we have to put up with them. August 8th: Arrived in Chattanooga last evening, and am now at the Gilmer Hospital. So many nurses can relate to Kate's issue with Dr. Avent. How many times has a nurse, acting as an advocate for her patient, confronted a physician? How many times have nurses sought to rewrite policies, or find better, more effective ways to care for patients? How many times as well have nurses found that they can no longer stay in a position they have held? The reason could be myriad: because of inabilities to deal with conflicting personalities; disagreements regarding policies; or perhaps it could be as simple as they wanted to try a new type of nursing. For whatever reason, for every nurse which has left one position to go to another, I applaud your willingness to experience something new. For every nurse who has had the courage to do as Kate did --to walk away, to leave the known and established for the unknown, I applaud your willingness to stand up for your convictions. I applaud your ability to learn a new form of nursing, to become accustomed to new surroundings. You bring to your new home of nursing the strengths and knowledge you have gained from other areas, helping your new nurse colleagues to grow by that which brought you to where you are today. On this National Nurses' Week, I thank you all. "Jack and Emma Were Here"
As I walked out the driveway to walk our beagle, Sparrow, I noticed the small pieces of green and blue water balloons littering the yard. These were signs our grandchildren had been there, shouting clearly: "Jack and Emma were here!" The little bits of latex balloons were the remnants of a weekend of fun and laughter shared not only with our grandchildren, Jackson and Emma, but also with our daughters and our youngest daughter's boyfriend, Sheldon. Image by adwriter via FlickrWe had made a trip to the store prior to Jack and Emma arriving and purchased a "slip and slide". I remember my Uncle Poppy making one of these for us to play with when I was a child and it was great fun. I had hoped our grandchildren would have the same impression. Their aunts filled I can't tell how many water balloons and both afternoons of the weekend were filled with sliding, slipping, tossing balloons and basically getting completely soaked. At least one afternoon included the obligatory water-hose battle. It was all fun -- not only for the three and four-year-old -- but for the adults as well. As I looked in the yard at the remnants of the water balloons, I was immediately taken back to the time we had spent together playing in the water. Our lives should each be that way. There should be remnants that we "have been there." There should be reminders that we have walked through life, that we touched others. Along the way should be remnants of comfort we have given, encouragement we have shared, love we have bestowed. Others should be able to think back to those moments shared between us and be thankful for the time spent together. Our investment in the lives of others doesn't have to be expensive. Like our water balloons and "slip and slide", sometimes the most meaningful things are relatively inexpensive, fairly simple. They just mean we must make the effort, take the thought about someone else. Let us be resolved to leave a trail of little bits of green and blue latex everywhere we have walked, a trail of the Love of Christ we have so generously shared with others. "Jesus and the Two Bad Guys"
The other day while our grandchildren were at our house playing, our three-year-old granddaughter Emmie had built a tower out of small rectangular blocks. Her four-year-old brother, not to be outdone, decided to build an even bigger tower. He poised single blocks in front of his tower. "They are the people waiting to get in," he explained. Then he decided to build two smaller towers on each side. A moment later his face lit up, his eyes grew wide and he waved his hands in excitement. It was clear a brilliant inspiration had entered his mind. "Look," he said excitedly, "it's Jesus and the two bad guys!" Looking again at his creation, it was easy to visualize the abstract version of the cross of Calvary, flanked by two lesser crosses. In front, the single rectangular blocks represented those watching at the foot of the cross. I was amazed, not only at Jackson's inspired interpretation of his blocks, but by the sheer excitement of his realization. In the little blocks he saw the Crucifixion, something you or I might have never seen in the formation. It was a good lesson for me. The wonders of our Lord, of His creation and indeed, as Jackson pointed out, even His crucifixion, exists all around us. Our eyes however have become dull to see these truths. When we begin to exercise our sensibilities to see these expressions of our Lord which surround us in every moment of our lives, our vision will become clearer and clearer. More and more we will see the secrets of our Lord in whom we "live and move and have our being." June 25th: Yesterday we sent many of our sick off. Today the hospital is again filled with wounded. We are still sending the wounded away who are able to be moved to make room for more, as the battle is still progressing. June 27th: We have a great many wounded; the same old story -- men mutilated in every possible way. In one place there are three men lying along side of each other; each has lost a leg. One has just died. I am sick at heart at these scenes, and there seems to be little prospect of a change. July 1st: Great excitement in town. News has come that the enemy is across the ricer, and intends shelling the place. We are having hospital flags put up, abut I do not see that they will do any good, as it is said the enemy pay no respect to them. We are packing up in a hurry to move. Our hospital being near the river, we will be honored by the first shot. The house we are now in is marked by last year's shelling. July 4th: What a glorious day this was once. Alas! how changed. It is now one of universal sorrow and gloom. If we could only visit the homes of many North and South, what a picture of desolation would be presented! The hospital is filled with sick and wounded men, and men worn out with hunger and fatigue. July 6th: We have just received orders to send every man away. Those who are not able to leave this place are to be sent to other hospitals, as we are so near the river, and would get, in case of an attack, the full benefit of the firing. July 21st: I regret leaving Chattanooga as the army is here, but its movements are very uncertain; perhaps before many days we may be much nearer it than we cared for, although Dr. Stout does not seem to think so. These entries from Kate's journal put me in mind of the more modern army nurse. Perhaps more than any other event, the roles thrust upon military nurses in war-time changed forever the roles of all nurses who followed them, civilian and military alike. Military nurses often had to take upon themselves the roles and actions that until that time were in the domain of the physician. Nurses found themselves with more autonomy and more authority than ever before and once having had it thrust among them, they were not about to let it go. These military nurses returned to states-side duty with a new confidence and new skills. They were quick to share these skills and to advocate that each nurse could utilize them in the best interest of the patient. So was nursing forever changed. Military nurses had to think quickly, move quickly and heal quickly. Shelling, as Kate described was a reality. Those who grew up in my era may remember watching the television show M*A*S*H in which the mobile hospital was bombed and shelled on a routine basis. Yet, surgery continued on, and at the side of those patients undergoing surgery were surgical nurses. instead of a nursing uniform, I thank you. 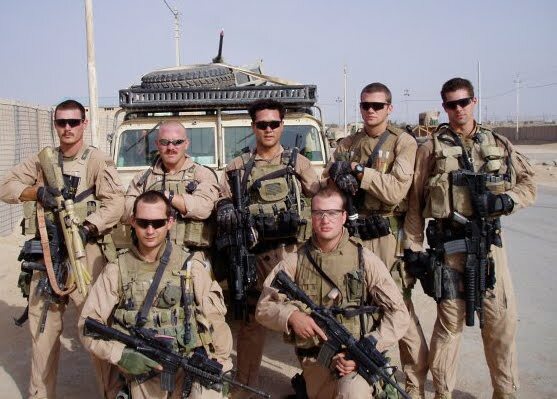 I thank you for serving our country and for changing our profession. to nursing of which we might never completely be aware. for healing our troops, for holding a hand of one dying. Thank you for caring to be willing to go. Today is May 6th, National Nurses Day. National Nurses Day always opens National Nurses Week which ends on May 12th, the birthday of Florence Nightingale. It is very fitting that we have an entry for Kate on this day, who had such an admiration of Florence Nightingale and her work during the Crimean War. February 10th: A hospital is the most cheerless place in the world, and the last place I would remain in from choice. If it were not for the sake of the wounded and sick men, I do not think I could possibly stand it. February 21st: Our room is a front one, and a hall some ten feet wide divides quite a large ward from us, which is filled with typhoid and pneumonia cases. I counted seven men in the ward, blistered severely. Though the room is so near ours, we have no time to spend in it. Many a time through the night we hear the men cough and groan, but we can not even allow our minds to dwell on these things, as it would unfit us for our duties. April 12th: War is a great leveler, and makes philosophers of us, when nothing else will. It astonishes me to see how the men adapt themselves to circumstances. April 13th: There are numbers dying in our hospital every day, and scarcely any note is taken of them. At home, when a member of the family is about to go to his last resting-place, loving friends are around the couch of the sufferer, and by kind words and acts rob King Death of half his terrors and smooth the pathway to the valley and shadow of death. But here a man near dissolution is usually in a ward with perhaps twenty more. It is sad to see so many dying with no kindred near them to sooth their last moments and close their eyes. April 16th: Miss Groom's health has been so feeble that she has been compelled to leave for home; she left yesterday; I went as far as Atlanta with her. Dr. O'Neal, an assistant surgeon of the Gilmer Hospital, accompanied us. The cars, on my way back, were loaded with troops from Mobile, going to reinforce Bragg; among them were some Georgia regiments. I was informed that the Thirty-sixth and Thirty-eighth Alabama Regiments were on the train; as I had some friends in them, I tried to see them, but failed. April 23rd: There is a report that there is fighting at the front. We have numbers of the Thirty-sixth and Thirty-eighth Alabama Regiments very sick. We are still very busy. We have almost every thing to buy ourselves. We pay two dollars per gallon for sweet milk; one dollar for buttermilk; eggs, one dollar per dozen; butter, one fifty per pound; coffee, five dollars. May 9th: We are in daily expectation of a battle; and we are completely out of rags -- a very necessary article at this time. We have just received two boxes, both from Mobile. The good people of that place could not have sent us any thing more acceptable. I also received a letter from a relative, informing me that the military aid society had some medicines they would send us, if we needed them. I asked Dr. Patterson, and he replied that nothing would be more acceptable, as many of our men have died for want of them. Strange to say that although the government does not provide near enough of medicines it will not permit us to spend our hospital fund for them, and we find it impossible to spend what we have on edibles, as they are not to be bought. Reading Kate's journal, I am often amazed at how the nurses had to be inventive in the procurement of goods and supplies for the men. Often she speaks of going to towns to barter or deal with citizens over edibles. Her listing of prices in this journal entry surprised me with their closeness to some of our own prices today. Needing rags and medicines and having them sent "from home" was another interesting entry. How many times have we as nurses had to be inventive or creative in how we treat our patients? Sometimes the tools or supplies simply haven't been invented. . .yet. I remember once when I first worked in NICU. Those were the early days of Neonatology and supplies for tiny premature infants just didn't exist as they do today. We were expecting a tiny baby in by transport, smaller than we had breathing tubes to use for resuscitation. We were scrambling around the nursery, pulling out all sorts of other supplies, trying to make what we did not have. We pushed this tube into that connector, trying for a fit, over and over again until finally we had something that would work, something that would be small enough to fit into the tiny baby's trachea. I can't remember the outcome of that little baby, but I remember the attitude, the persistence of the nurses in our unit. We were not going to fail. I can just imagine Kate being the same way. She was not going to let her boys down. thanking you for your own attitudes of persistence and perseverance. knowing that there could be life and health and healing. May you each have the Nurses Week I know you deserve. It has been interesting in reading Kate's journal how her cares and concerns have changed. In the beginning, so much was about the horror and suffering she was witnessing. 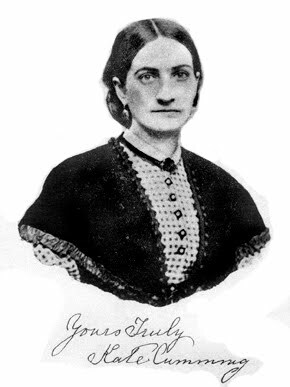 As her nursing progressed, there is less about that in her journal, although at one hospital she stated, "All our men seem to die resigned; but it is difficult to judge of their frame of mind, as they are too fr gone with disease when they come here to talk to them on the subject of death, which is another proof of the necessity of preparing, while in health, for that long journey form which no traveler returns." Many of her concerns as the journal continues are of how to care for the men, how to procure the supplies or the personnel needed to meet their needs. It is obvious she has learned the lesson all nurses must learn at some point, how to put aside the pain and suffering until later, that the work must come first, and then later, when alone, the nurse can deal with his or her own feelings about what has been seen or heard. Kate has learned to continue on, to go about the business of healing and taking care of what must be done. Over and over again in her journal she writes of the needs of the men: for milk, for clothing, for certain types of food, and for persons to cook that food correctly. September 16: I arrived at Chattanooga this morning, about 5 o'clock, having left Dalton on the 15th. Mrs. Thornton arrived there before I left. We are now in the Newsom Hospital. It is a very large one, having been enlarged to double the size it was when we visited it before. We have nothing to cook on but one small stove, and that a smoky one. It cooks for the whole of this side of the hospital. We have nothing to give the men to eat but wheat-bread, fresh beef, rice, tea and coffee. September 19: I have been kept quite busy ever since I came here; in fact, we all have been. We have a good deal to try us, but our minds were made up to expect that before we came. One of our greatest trials is want of proper diet for sick men. We do the best we can with what we have -- toast the bread and make beef tea; and we have a little butter - bad at that. There are no changes of clothing for the men; but we have cloth, and after our day's work is done, we each make a shirt, which a great help. September 28th: Have been very busy all the week, too much so to write in my journal. Diarrhea is the prevailing disease among the patients. The great cry of our sick is for milk. We could buy plenty, but have no money. We get a little every day for the worst cases, at our own expense. I intend letting the folks at home know how many are suffering for want of nourishment, for I feel confident that if they knew of it they would send us means. October 12th: I do hope some one prayed for me today, as I have been too cross to do so myself; have had one of the most trying days of my life. I wonder if Miss Nightingale had any of the hardships to endure that we have. I have another kitchen, and the chimney of it smokes as badly as the others. I spent the whole day in it. To add to all, it has poured down rain all day, and the wood was so wet that it was almost impossible to make it burn. I thought of home and home comforts not a few times. We have men for cooks; but as they are taken from the convalescent patients, they are scarcely fitted for the work. I have had some two or three, but as soon as they are initiated into the mysteries of the culinary art they take sick; so we have a good deal of it to do ourselves. October 27th: Patients from Bragg's army are coming in daily; the hospital is full of them. I thought I had found a treasure in a woman whom I made my head cook; but on going into the kitchen this morning, found her in such a state of intoxication I had to dismiss her, and fall back on the convalescent men as cooks. It seems hard to make them understand the importance of cooking properly. There are many things, if not correctly prepared, are very injurious to the sick. In reading her journal, my heart goes out to Kate, trying to care for the men in her ward and cook on that smokey stove as well. I can feel her indignation when she found the intoxicated cook in the kitchen. I would imagine we could have seen some Scotch temper there. In reading, I felt her frustration as well. How many of us as nurses have felt the pinch of a short-staffed night? Or a day when the patients just kept coming in and perhaps the nurses kept calling in? We all did just what Kate did, we heaved a big sigh and went about the business of "doing the best we can with what we have." I can remember many a time having to "regroup", to reassign patients until we have evenly distributed them among the available nurses. I remember one night when we delivered seven babies in forty-three minutes with four nurses. The first nurse was the only one to actually deliver her own patient. Each of us just took whomever we needed to take to get the job done and in the end, each patient and each baby had been delivery and cared for properly. But it was a blur of baby-birthing activity! So far all of my brother and sister nurses who have worked short-handed, who have done more than their share of duty during a shift, I pat you on the back, knowing it is possible no one else did. Your dedication and your determination has not gone unnoticed. Looking at the pictures I am both amazed, heartbroken and incredibly thankful. Beginning on Monday April 25th, a series of 146 confirmed tornadoes traveled from Arkansas to Georgia and then reached even as far north as Pennsylvannia and New York, breaking, tearing and destroying for three days. On Wednesday, April 27th, the storms traveled through Alabama causing this day to become the deadliest tornado day in the United States since the 1925. According to Image by McClammaIV via Flickrthe National Weather Service, the path of destruction from one of the storms was 80.3 miles long with a maximum width of 1.5 miles. Initially it has been given a rating of "at least EF-4", but that may be increased once heavily damaged areas have been surveyed. 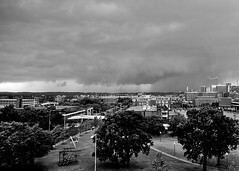 (The image seen here is one of the Tuscaloosa tornadoes as seen from the UAB campus,) This is the storm which destroyed so much of Tuscaloosa, Birmingham and other Alabama cities. These storms not only destroyed houses, entire subdivisions, but in some locations destroyed entire towns. It is reported the towns of Smithfield, Mississippi, Hackleburg, Alabama and Phil Campbell, Alabama were totally destroyed by two F5 tornadoes. ( It was the first time since 1990 two F5 tornadoes have occurred on the same day.) Just imagine an entire town gone. Two entire towns gone. In this day and time it is actually possible to watch video of some of these storms and Image via Wikipediaviewing them it is understandable the destruction they would cause. The death toll continues to climb, and will climb more than we will ever really know because there are so many "unidentified" bodies that are not yet counted in the death toll. Long after the tornadoes disaster stops being "relevant" news for newscasters, the death of loved ones will still be discovered by family members. That evening, I watched video after video. I looked at picture after picture. With each video and each picture, my heart hurt so much for all those who have been affected by this storm. But my heart felt something else as well. As I looked at the pictures of whole subdivisions blown away, I thought of our oldest daughter who lived for ten years in an apartment on the Black Warrior river in Tuscaloosa. In one video a meteorologist said the massive tornado followed the path of the Black Warrior river. Trying to hide my tears, I had to go to my daughter, hug her and tell her how glad I was she didn't live there now. But I felt selfish in my own relief, selfish that I could easily hug my daughter in the comfort of our own home. Here in the Deep South, we are used to strong winds, as we face hurricane season from June to November of each year. But with hurricanes there is time to prepare, usually time to evacuate if necessary. Yet, I have had the experience of standing with my family in the front yard, forming a circle of prayer before leaving our home, feeling the certainty in my heart that our home would not be standing when we returned. But the wind turned, the Category 5 storm abated and nothing was lost, praise the Lord. I can't imagine what it would be like to turn around in a matter of minutes and find everything gone. I can't imagine not even having a change of clothes or a toothbrush. . .the simplest of things. I can't imagine not having my most prized and cherished belongings: my bible, those love letters, those letters my son wrote from boot-camp, the video of my daughter's birth, the graduation announcements, the baby teeth that fell out, the little child hand-prints, those crayon drawings from so long ago. I can't imagine them flown to the wind, torn, flying who knows where to never be seen again. These dear ones who have lost so much need so much. And thankfully there are so many who are willing to give and willing to take what is given where it is needed. We learned first hand of the kindness of strangers after Katrina. Groups from all of the country came to the Gulf Coast to help rebuild houses and one group rebuilt the house of one of our dear friends. I have no doubt these kind and giving people are already on their way to Mississippi, Alabama and Georgia to put their hammers, saws and paintbrushes to use. But what these injured souls really need is prayer. Continued prayer. They have lost homes, and those can be rebuilt. But they have lost a sense of security, too. They have lost a sense of home. They have lost memories and many. . .too many. . .have lost family. They will grieve for a long time, but they will not grieve until the shock has worn away. They will need prayer long after most will have forgotten they even have a need. It is so easy to forget the discomfort of others when we sit in comfort ourselves. Let us resolve to remind each other to pray for these that have lost so much. Let us pray that they will know the peace and comfort of He who is the "Father of mercies, and the God of all comfort". Let us pray that they will know His supply that is "abundantly above all that we ask or think". Let us remember that we have been enjoined to "bear ye one another's burdens, and so fulfil the law of Christ." So let us wear these dear ones on our hearts and lift them up frequently to the Lord remembering that He "is gracious, and full of compassion; slow to anger, and of great mercy". At the Nursing Home where we do chapel services on Sunday mornings, there has been a change in schedule. After the services, we have been helping the residents down the hall to the Dining Room, but now lunch is not served for an hour or more after church. Instead of each going to their own room, many of the residents wait in the Activities Room across the hall from the Dining Room. One of the ladies was obviously not comfortable with the change in the schedule. She was becoming more and more agitated, but was unable to clearly articulate exactly what it was she wanted. Finally, in desperation, she said, "I don't think you know who I am!" I tried my best to console her, and to reassure her that she was just across the hall from where she wanted to be. One of the other residents wheeled herself near to this dear lady and told her, "I'll sit here with you and take care of you until it's time to go to lunch." What a sweetheart! But the statement, "I don't think you know who I am!" stuck in my mind. We all want to be recognized, perhaps not for doing great things, or even little things, but at least for being ourselves. Can't you remember sometime when you saw someone you knew and you were waiting for them to recognize you. . .and they didn't? It hurts not to be recognized, to be overlooked, to be forgotten. There used to be a television show with the theme song which went, "Sometimes you want to go where everybody knows your name. . .and they're always glad you came!" The most wonderful thing is there is One who has never overlooked us, who has never forgotten us, who always knows our name. And He is always, always glad when we turn our thoughts, our words, our attention toward Him. I was at work the other day and one of the nurses called out my name for help. Now this happens quite frequently at work. Immediately I knew which nurse had called out, where she was and I was able to head right to her to help. That is how our Lord is, we don't have to introduce ourselves to Him. I don't have to start a prayer with, "Lord, this is Frannie." He knows. He knows exactly who we are and where we are. He even knows the precise details of our circumstances better than we do, for He knows the hearts of everyone involved. He knows us, He really knows us. He has not forgotten "who we are."